Here's a quick bird update for the week. It was a good week! Sunday I swung by Lake Como while Chelsey and Camden we on a play date and I saw a Northern Rough-winged Swallow. Monday at work Paul pointed out that the Blue-gray Gnatcatchers were back. He always seems to be keyed into their return. They were all over the tops of the trees right outside the front door. Tuesday, May 20th I helped set up some mist nets in the morning with Paul and a volunteer. We walked past the area where we usually see Blue-winged Warblers and sure enough we could hear the buzzy electric like call. The bird flushed across the street but we were setting nest there too and we soon spotted the bird. I had a few minutes at the very end of the day so I swung by the bog to see who would be there in the afternoon. I didn't even have to go down onto the boardwalk. In the afternoon the sun shines on the north end of the bog and I spotted a little bird taking a bath in am open spot near the edge of the bog. He flew up into an alder bush and I could see right away that it was a Chestnut-sided Warbler. There were many redstarts around as well. Wednesday morning I headed to the bog for a quick look around and saw a Wood Thrush on the hill on the south side. Coming back across the boardwalk I could see a small bird in a maple tree leafing out. I took a look and it was a very yellow warbler. I watched for a few minutes as he madly hopped from branch to branch and soon I could see a little black cap. It was a Wilson's Warbler! Woo hoo, that's a lifer. On the way home I saw my first Eastern Kingbird on a barbed wire fence along Norell ave just south of work. Thursday I escorted a group down to the lake at work and on the way back I saw my first Scarlet Tanager of the year. They are always breathtaking. I could hear a lot of Red-eyed Vireos as well and finally got a good look at one. That was also a first of the year. On the hike back I also saw American Robins, Great-crested Flycatchers, White-breasted Nuthatches, and a Rose-breasted Grosbeak. Over the Memorial Day weekend I went to my inlaws house in Wisconsin and saw a Tufted Titmouse and House Wrens in their yard. Both first of the years. 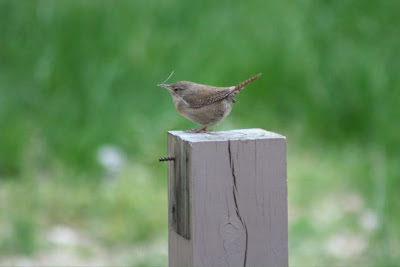 The little wren was taking nesting material into a nestbox. Sunday, May 25th a likely tornado or possibly straight line winds ripped a swath of destruction though the nature center. Tuesday we went out as a staff to assess the damage on the trails. I'm post more about that later but the good news is that during the hike I spotted a wealth of new birds including three lifers. I saw a Blackpoll warbler, a Blackburnian Warbler and a Canada Warbler. For my year list I also added Mourning Warbler and an Eastern Wood-pewee. It was the best view of a Mourning Warbler I'd ever had and it was gorgeous. The Blackburnian Warbler was breathtaking as well.